On 22 May 2014, the Royal Thai Armed Forces, led by General Prayut Chan-o-cha, Commander of the Royal Thai Army (RTA), launched a coup d'état, the 12th since the country's first coup in 1932, against the caretaker government of Thailand, following six months of political crisis. The military established a junta called the National Council for Peace and Order (NCPO) to govern the nation. Civil law, or civilian law, is a legal system originating in Europe, intellectualized within the framework of Roman law, the main feature of which is that its core principles are codified into a referable system which serves as the primary source of law. This can be contrasted with common law systems, the intellectual framework of which comes from judge-made decisional law, and gives precedential authority to prior court decisions, on the principle that it is unfair to treat similar facts differently on different occasions. Habeas corpus is a recourse in law through which a person can report an unlawful detention or imprisonment to a court and request that the court order the custodian of the person, usually a prison official, to bring the prisoner to court, to determine whether the detention is lawful. The Black War was a period of violent conflict between British colonists and Aboriginal Australians in Tasmania from the mid-1820s to 1832. With an escalation of violence in the late 1820s, Lieutenant-Governor George Arthur declared martial law in November 1828—effectively providing legal immunity for killing Aboriginal people. It would remain in force for more than three years, the longest period of martial law in Australian history. The Black War was the period of violent conflict between British colonists and Aboriginal Australians in Tasmania from the mid-1820s to 1832. The conflict, fought largely as a guerrilla war by both sides, claimed the lives of more than 200 European colonists and between 600 and 900 Aboriginal people, nearly annihilating the island's indigenous population. The near-destruction of the Aboriginal Tasmanians, and the frequent incidence of mass killings, has sparked debate among historians over whether the Black War should be defined as an act of genocide. Hassanal Bolkiah, GCB GCMG is the 29th and current Sultan and Yang di-Pertuan of Brunei. He is also the first and incumbent Prime Minister of Brunei. The eldest son of Sultan Omar Ali Saifuddien III and Raja Isteri (Queen) Pengiran Anak Damit, he succeeded to the throne as the Sultan of Brunei, following the abdication of his father on 5 October 1967. Sultan Hassanal was also known as the Chairman of the Association of Southeast Asian Nations (ASEAN) in 2001 and 2013 due to the hosting of the ASEAN summits to those due dates. In Egypt, a State of Emergency has been in effect almost continuously since 1967. Following the assassination of President Anwar el-Sadat in 1981, a state of emergency was declared. Egypt has been under state of emergency ever since; the Parliament has renewed the emergency laws every three years since they were imposed. The legislation was extended in 2003 and were due to expire at the end of May 2006; plans were in place to replace it with new anti-terrorism laws. But after the Dahab bombings in April of that year, state of emergency was renewed for another two years. In May 2008 there was a further extension to June 2010. In May 2010, the state of emergency was further extended, albeit with a promise from the government to be applied only to 'Terrorism and Drugs' suspects. Military administrative government was in effect from 1949 to 1966 over some geographical areas of Israel having large Arab populations, primarily the Negev, Galilee, and the Triangle. The residents of these areas were subject to martial law. The Israeli army enforced strict residency rules. Any Arab not registered in a census taken during November 1948 was deported. Permits from the military governor had to be procured to travel more than a given distance from a person's registered place of residence, and curfew, administrative detentions, and expulsions were common. Although the military administration was officially for geographical areas, and not people, its restrictions were seldom enforced on the Jewish residents of these areas. In the 1950s, martial law ceased to be in effect for those Arab citizens living in predominantly Jewish cities, but remained in place in all Arab localities within Israel until 1966. On 23 May 2017, President Rodrigo Duterte declared martial law throughout the main southern island of Mindanao, through Proclamation No. 216, due to the attack of Maute Group in Marawi City, Lanao del Sur. It was announced in a briefing in Moscow by Secretary Ernesto Abella,  and will be in effect until December. The martial law concept in the United States is closely tied with the right of habeas corpus , which is in essence the right to a hearing on lawful imprisonment, or more broadly, the supervision of law enforcement by the judiciary. The ability to suspend habeas corpus is related to the imposition of martial law. 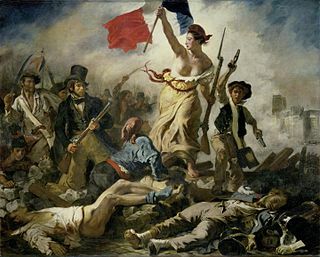 Article 1, Section 9 of the US Constitution states, "The Privilege of the Writ of Habeas Corpus shall not be suspended, unless when in Cases of Rebellion or Invasion the public Safety may require it." 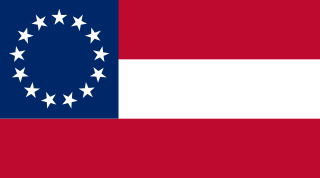 There have been many instances of the use of the military within the borders of the United States, such as during the Whiskey Rebellion and in the South during the Civil Rights Movement, but these acts are not tantamount to a declaration of martial law. The distinction must be made as clear as that between martial law and military justice: deployment of troops does not necessarily mean that the civil courts cannot function, and that is one of the keys, as the Supreme Court noted, to martial law. West Pakistan was one of the two exclaves created at the formation of the modern State of Pakistan following the 1947 Partition of India. A state of emergency is a situation in which a government is empowered to perform actions that it would normally not be permitted. A government can declare such state during a disaster, civil unrest, or armed conflict. Such declaration alerts citizens to change their normal behavior and orders government agencies to implement emergency plans. Justitium is its equivalent in Roman law—a concept in which the senate could put forward a final decree that was not subject to dispute. The 1999 Pakistani coup d'état was a bloodless coup d'état in which the Pakistan Army and then-Chief of Army Staff and Chairman of the Joint Chiefs of Staff Committee, General Pervez Musharraf, seized the control of the civilian government of publicly elected Prime Minister Nawaz Sharif on 12 October 1999. Two days into seizing the government, on 14 October 1999, General Musharraf, who then-acted as the country's Chief Executive, declared a state of emergency by issuing a Provisional Constitutional Order that suspended the writ of the Constitution of Pakistan. 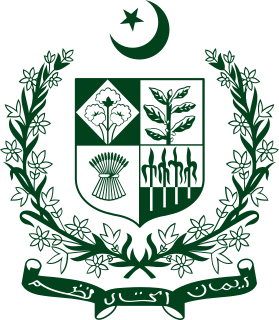 The office of the Chief Martial Law Administrator was a senior government authoritative post with ZMLA as Zonal Martial Law Administrator as deputies created in countries such as Pakistan, Bangladesh and Indonesia that gave considerable executive authority and powers to the holder of the post to enforce martial law in the country in an events to ensure the continuity of government. This office has been used mostly by military officers staging a coup d'état. On some occasions, the office has been under a civilian head of state. The Chief of Army Staff, is a military appointment and statutory office held by the four-star rank army general in the Pakistan Army, who is appointed by the Prime Minister of Pakistan and final confirmation by the President of Pakistan. Habeas corpus is a recourse in law challenging the reasons or conditions of a person's confinement under color of law. A petition for habeas corpus is filed with a court that has jurisdiction over the custodian, and if granted, a writ is issued directing the custodian to bring the confined person before the court for examination into those reasons or conditions. The Suspension Clause of the United States Constitution specifically included the English common law procedure in Article One, Section 9, clause 2, which demands that "The privilege of the writ of habeas corpus shall not be suspended, unless when in cases of rebellion or invasion the public safety may require it." A state of emergency was declared by President of Pakistan Pervez Musharraf on 3 November 2007, and lasted until 15 December 2007, during which time the constitution of Pakistan was suspended. When the state of emergency was declared, Musharraf controversially held both positions of President and Chief of Army Staff. He later resigned as army chief 25 days into the emergency on 28 November. The state of emergency and its responses are generally attributed to the controversies surrounding the re-election of Musharraf during the presidential election on 6 October 2007, including his holding of both offices of President and Chief of Army Staff at the time. The Provisional Constitutional Order, popularly known as PCO, is an emergency and extra-constitutional order that suspends either wholly or partially the Constitution of Pakistan— the supreme law of land. The PCO fulfills and act as the temporary order while the constitution is held in abeyance or suspension. Mostly, the orders have been enforced during the times of the martial law imposed by the armed forces of the country against the civilian governments. Martial law in the Philippines refers to several intermittent periods in Philippine history wherein the Philippine head of state places an area under the control of the Armed Forces of the Philippines and its predecessor bodies. Martial law is declared either when there is near-violent civil unrest or in cases of major natural disasters, however most countries use a different legal construct like "state of emergency". Operation Fair Play was the code name for the 5 July 1977 coup by Pakistan Chief of Army Staff General Muhammad Zia-ul-Haq, overthrowing the government of Prime Minister Zulfikar Ali Bhutto. The coup itself was bloodless, and was preceded by social unrest and political conflict between the ruling leftist Pakistan Peoples Party government of Bhutto, and the right-wing Islamist opposition Pakistan National Alliance which accused Bhutto of rigging the 1977 general elections. In announcing the coup, Zia promised "free and fair elections" within 90 days, but these were repeatedly postponed on the excuse of accountability and it was not until 1985 that ("party-less") general elections were held. Zia himself stayed in power for eleven years until his death in a plane crash. The Constitution of 1956 was the fundamental law of Pakistan from March 1956 until the 1958 Pakistani coup d'état. It was the first constitution adopted by independent Pakistan. There were 234 articles 13 parts and 6 schedules. 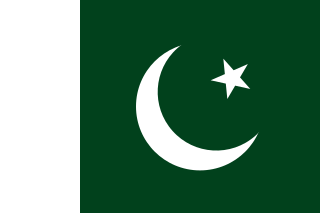 The 1958 Pakistani coup d'état refers to the events between October 7, when the President of Pakistan Iskander Mirza abrogated the Constitution of Pakistan and declared martial law, and October 27, when Mirza himself was deposed by Gen. Ayub Khan, the Commander-in-Chief of the Pakistani Army. Pakistan's first military coup followed a period of prolonged political instability in which Pakistan's dominant political party, the Pakistan Muslim League, was unable to successfully govern on the basis of shared programs or policies. Broadly, political scientists have argued that the susceptibility of a military system to coups is inversely correlated with the strength of its political parties. The 1982 Bangladeshi military coup d'état deposed the civilian government headed by the president of Bangladesh Abdus Sattar and brought to power the Chief of Army Staff of the Bangladesh Army Lt. Gen. Hussain Muhammad Ershad. After serving initially as the Chief Martial Law Administrator, Ershad assumed the post of president in 1983 and ruled until 1990. An emergency law was first enacted in Egypt in 1958, as Law No. 162 of 1958. A state of emergency was declared in 1967 during the 1967 Arab–Israeli War which lasted until 1980. After a break of 18 months, a state of emergency was reimposed following the assassination of President Anwar Sadat in 1981, and was repeatedly extended every three years. The continuous state of emergency was one of the grievances of demonstrators giving rise to the Egyptian Revolution of 2011. In April 1961, Sierra Leone became politically independent of Great Britain. It retained a parliamentary system of government and was a member of the British Commonwealth of Nations. The Sierra Leone People's Party (SLPP), led by Sir Milton Margai were victorious in the first general election under universal adult franchise in May 1962. Upon Sir Milton's death in 1964, his half-brother, Sir Albert Margai, succeeded him as Prime Minister. Sir Albert attempted to establish a one-party state had the ready cooperation of the opposition All People' Congress but met fierce resistance from some cadre within his party Sierra Leone People's Party (SLPP) and ultimately abandoned the idea. The National Council for Peace and Order is the military junta that has ruled Thailand since its 2014 Thai coup d'état on 22 May 2014. On 20 May 2014, the military had declared martial law nationwide in an attempt to stop the country's escalating political crisis, and to force the democratically elected government out. On 22 May, the military ousted the Yingluck Shinawatra government and formed the NCPO to take control of the country. The junta censored the broadcasting system in Thailand, suspended the constitution, and detained members of the Thai cabinet. Martial law in the United States refers to several periods in United States history wherein a region or the United States as whole are placed under the control of a military body. On a federal level, only the president has the power to impose Martial Law. In each state the governor has the right to impose martial law within the borders of the state. 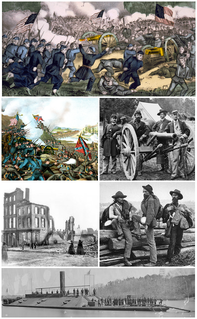 In the United States, martial law has been used in a limited number of circumstances, such as directly after a foreign attack, such as Hawaii after the Japanese attack on Pearl Harbor or New Orleans during the Battle of New Orleans; after major disasters, such as the Great Chicago Fire of 1871 or the San Francisco earthquake of 1906; local leaders declared martial law to protect themselves from mob violence, such as Nauvoo, Illinois, during the Illinois Mormon War, or Utah during the Utah War; or in response to chaos associated with protests and mob action, such as the 1934 West Coast waterfront strike, or mob actions against the Freedom Riders. ↑ Anonymous (19 August 2010). "Martial Law". LII / Legal Information Institute. ↑ Boyce, James (2010). Van Diemen's Land. Black Inc. p. 266. ISBN 978-1-921825-39-2. ↑ Joelle Bassoul. Egypt renews state of emergency for two years. Middle East On-line, 1 May 2005. 1 2 "The Iranian Revolution | King Pahlavi (the Shah) against Dissent". MacroHistory: World History . Retrieved 2010-12-23. ↑ "Emad Baghi :: English". www.emadbaghi.com. ↑ "Article 79", Constitution of the Islamic Republic of Iran, 1989, retrieved 17 September 2017, The proclamation of martial law is forbidden. ↑ "Iranian Constitution" (PDF). WIPO. Retrieved November 25, 2018. 1 2 Valerie Féron (2001). Palestine(s): Les déchirures. Paris, Editions du Felin. ISBN 2-86645-391-3. ↑ Bassma Kodmani-Darwish (1997). La Diaspora Palestinienne. Paris: Presses Universitaires de France. ISBN 2-13-048486-7. 1 2 3 Katz, Yaakov; Mizroch, Amir (July 15, 2006). "Martial Law Declared in the North". The Jerusalem Post . Retrieved 7 June 2017. ↑ Gulbul, Raouf. "Arbitrary arrest". Defi. Archived from the original on 2014-05-12. ↑ Cupren, Indradev. "Human Rights in Mauritius". Le Defi. Archived from the original on 2014-05-12. 1 2 "Arroyo declares martial law in Maguindanao province". ↑ News, ABS-CBN. "Duterte declares Martial Law in Mindanao". ↑ "Special Project – Having an Accurate Understanding of Korea's Modern History". Pyungkangcheil Church. Retrieved 2013-05-05. ↑ Song, Jung Hee (March 31, 2010). "Islanders still mourn April 3 massacre". Jeju weekly . Retrieved 2013-05-05. ↑ Rhee, Moon Young (April 18, 2011). "4·19때 경찰이 계엄사령관에 총탄 10만발 빌려달라 요청". Hankyoreh . Retrieved 2013-05-05. ↑ P, Bundeskanzlei -. "SR 510.10 Bundesgesetz vom 3. 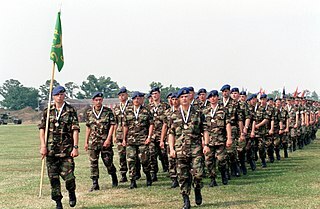 Februar 1995 über die Armee und die Militärverwaltung (Militärgesetz, MG)". www.admin.ch. ↑ "Historischer Abriss zum Thema Ordnungsdienst". www.admin.ch (in German). Retrieved 2018-11-27. ↑ Pakorn Nilprapunt (April 2, 2012). "Martial Law, B.E. 2457 (1914) unofficial translation" (PDF). Thailand Law Forum. Office of the Council of State (Thailand). Archived from the original (PDF) on May 30, 2014. Retrieved May 30, 2014. Reference to Thai legislation in any jurisdiction shall be to the Thai version only. This translation has been made so as to establish correct understanding about this Act to the foreigners. ↑ "Thailand Crisis: Army Declares Martial Law" (May 20, 2014). BBC.com. Retrieved 2018-09-14. ↑ Arango, Tim; Yeginsu, Ceylan (15 July 2016). "Turkish President Returns to Istanbul in Sign Military Coup Is Faltering" – via NYTimes.com. ↑ Matthew Kupfer (26 November 2018). 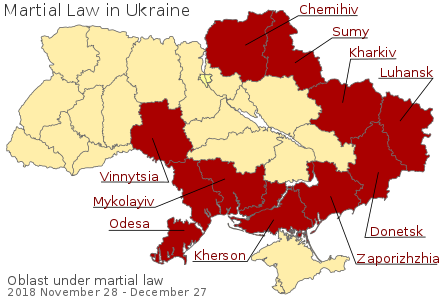 "What martial law in Ukraine could mean for nation". Kyiv Post. Retrieved 26 November 2018. ↑ "Verkhovna Rada adopts Law "On legal regime of martial law"". Verkhovna Rada of Ukraine. 12 May 2015. Retrieved 26 November 2018. ↑ "Kiev declares martial law after Russian seizure of Ukrainian ships in Black Sea". The Independent. Retrieved 2018-11-26. ↑ G. Edward White (2012). Law in American History: Volume 1: From the Colonial Years Through the Civil War. Oxford University Press. p. 442. ISBN 978-0-19-972314-0. As the above details suggest, the imposition of martial law and the suspension of the writ of habeas corpus are related, but do not perform identical functions. Macomb, Alexander, Major General of the United States Army, A Treatise on Martial Law, and Courts-Martial as Practiced in the United States. (Charleston: J. Hoff, 1809), republished (New York: Lawbook Exchange, June 2007). ISBN 1-58477-709-5 , 978-1-58477-709-0. Wikimedia Commons has media related to Martial law .